While priced competitively, ElectionsOnline’s online voting service makes no attempt to be the cheapest of its kind. It makes every attempt to be the most feature-packed and user-friendly. Creating usable software doesn’t happen by dumb luck. It requires an aptitude, expertise and investment in research. Because our commitment to usability distinguishes us from the competition and has established ElectionsOnline as the standard-bearer among election service providers, this article provides a glimpse into some of what’s done to ensure that reputation is upheld and offers some guidance for how your own organization may get started improving its website’s user-friendliness. After years of working in usability and being certified by Human Factors International as a Certified Usability Analyst, the most valuable piece of advice about it I could share is, respond to what users do, not what they say they do. A lot can get lost in translation and I’ve seen countless examples of a person reporting difficulty accomplishing something with a computer, yet when you stand over her shoulder and watch her attempt the troublesome task, it becomes evident the difficulty stems from something entirely different that she never mentioned anything about. To get to the real root cause of human-computer interaction difficulties, usability tests must be conducted where people who are representative of a website’s users are placed in front of the website and asked to complete specific tasks. Furthermore, such testing should not be conducted only in response to some reported problem, but any time an interface is being developed or modified. I recall conducting usability tests on a site once where it was reported that users were encountering difficulty finding certain pieces of content. Scenarios were crafted that would ask representative users to locate those pieces of content, and while it was discovered that in fact there were no major issues finding the sought after content, there were issues simply interfacing with the navigation. The navigation used a once popular, two-tier menu where submenus were hidden until the user passed the mouse over an item in a higher level menu triggering the submenu to appear. During testing it became apparent that those with shaky hand eye coordination had difficulty using the mouse to hit the target areas throughout this navigation system. In this case, had usability testing been conducted on the site just as a part of standard operating procedure, rather than in response to some perceived problem, this difficulty would likely have been discovered years sooner. There are several things done to ensure a positive user experience at this website whether it’s for voters, election administrators or just passers-by making a first-time visit. Usability test on the website. As you might expect after reading the above, conducting usability tests on the website’s interface occurs any time something new is developed or something existing is modified. Usability test the documentation. That’s right, usability testing does not stop at the website itself. When written documentation plays a role, that documentation should also be tested to ensure it concisely describes the process it supports. This point deserves a special note. A well designed computer interface will ideally not require documentation. In other words, if the designers have done their job, it should not be necessary to describe how to use the interface elements with external documentation—though it is ok to embed documentation directly into the interface itself. However, election administration is a process that includes steps occurring away from the online ballot setup tool, so there’s value in providing documentation that walks step-by-step through the entire process. Providing user control. There’s more to providing a fulfilling user experience than just ensuring good website usability. A website that does not disclose pricing information could undergo a usability test for some very specific task, and pass with flying colors, yet still provide an overall frustrating experience for users by not enabling them to determine what a service or product costs. To this end, a company simply needs to listen. Identify the things prospective clients most want to know and make sure it can be easily found online to save the prospect from having to place a phone call to determine what should be a very fundamental piece of information. Define tasks. Define some very specific tasks that you would like to be certain can be accomplished on your website. Recruit participants. Recruit representative users to complete these tasks while you monitor their use of the website. “Representative users” does not mean internal staff who are already familiar with the website. If you’re a membership organization, perhaps you could entice some of your rank and file members to come by your office for pizza and website testing? If they’re simply too busy to make a special trip to help you out, perhaps you could piggy-back your testing session onto some other event for which they’re already coming to your offices. The magic number here is 5 or 6. You could test 50 or 60, but research shows that 5 or 6 is really all that’s necessary to begin identifying problem spots. Explain to the participant what you’re doing. Make him feel as relaxed as possible. Ensure he understands it’s not him, but the website, that’s being tested. Nothing he can do is either right or wrong; you’re simply trying to understand how well the website supports users. If he gets stuck and is unable to complete a task, it’s the website that failed, not him. Encourage him to talk out loud. What you’re doing is a qualitative analysis as opposed to quantitative. You can look at your website’s traffic reports or conversion rates and understand what’s going on quantitatively. What you’re after here is an understanding of what’s going on inside the head of a user as he attempts to complete a task. While much of that will be answered by just watching his actions, you’ll get even more insight if you can get him to talk out loud. Keep it short. While a very formal usability test might last an hour, I like to keep them to about 15 minutes so the participant doesn’t feel like it’s too much of a burden. Follow this piece of advice and the participant may just go back to his office and encourage others to volunteer as a participant at a later date. This of course depends enormously on the types of participants you’re recruiting and the sort of environment in which they work. Monitor actions. As the participant works through completing the tasks, you sit quietly and don’t interfere other than to maybe encourage him to talk out loud. Take notes and perhaps even video record the session if you think you’ll need to refer back to that video to demonstrate to upper management that there really is a problem. Follow up. Based on what you’ve witnessed, follow up may simply mean you need to conduct further testing, or you may be ready to begin modifying the website to correct any problem spots. There is no replacement for experience and a strong aptitude for the art of interface design when it comes to knowing how to interpret any problem spots identified during testing and how best to fix them. Be honest with yourself about your skill set, and if you don’t have that experience or aptitude, retain a consultant that does. Otherwise your “fix” could make things worse. 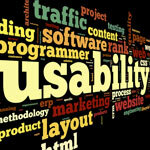 Usability 101: Introduction to Usability This links to an article by Jakob Nielsen, globally recognized as the preeminent guru of usability. Spend more time at the Nielsen Norman Group website reading through all the studies and white papers pertaining to usability for more information. Purchase Steve Krug’s seminal book, Don’t Make Me Think. When you’re ready for some formal training, check out both Human Factors International and the Nielsen Norman Group. Both companies offer courses all over the globe taught by capable instructors with years of experience practicing what they preach. Refer to the Human Factors International CUA Directory. Very few of the individuals listed there work as consultants, but it’s a starting point to finding one who does who may be less expensive than hiring one of the big firms. There are some very cool calculators that provide the return on investment for improving usability at http://www.humanfactors.com/coolstuff/roi.asp. Visit UserTesting.com. This site supports an ability for your website to be tested by remote users who record their session. It is preferable for usability testing to be done face-to-face of course, but if you’re on a tight budget, or physically unable to bring representative users to your office location for testing, this can be a viable and economical solution. The core message here is that doing something is better than doing nothing. Even if you have no experience at this and commit some mistakes along the way, it is likely that you’ll at least discover that you have problems you were never aware of previously, and that is the first step towards making improvement!